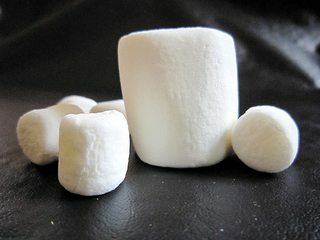 Marshmallows are a white, fluffy candy, that easily melts and becomes sticky. They are almost all sugar (and corn syrup which is also sugar), with whipped gelatine. They're vanilla flavored, usually with clear vanillin, because the pure whiteness is the very essence of the candy. The little ones are often served in hot chocolate milk, and they're often used as ingredients in other things like fudge. 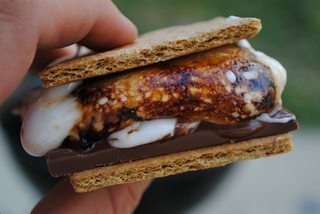 Put the roasted marshmallow between graham crackers with chocolate, you have a s'more, a favorite snack of campers everywhere. 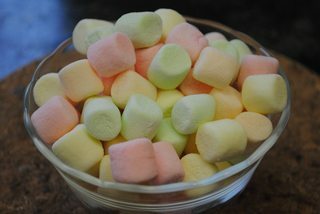 Here's a tour of a huge marshmallow factory: YouTube video with some fun trivia too. Not the answer you're looking for? Browse other questions tagged candy fondant or ask your own question. 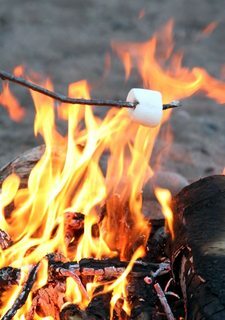 How can I make vegetarian marshmallows?